You may not spend much time mulling your debt-to-credit ratio, but it weighs heavily on your credit score and can determine your ability to get a loan. NEW YORK (CNNMoney.com) -- Consumers know all too well that going over their credit limit can mean a nasty fee, a higher interest rate and maybe even a lower credit score. But few people are aware that merely approaching their limit can have costly consequences as well. That's because your debt-to-limit ratio, or "debt utilization," is a key component of your credit score. Your debt-to-limit ratio is calculated by dividing what you've spent by your total credit limit. If you have a $5,000 limit and you've charged $4,000 this month, your debt-to-limit ratio is 80%, which is enough to signal to lenders that you are a high risk borrower. As a result, lenders may increase your annual percentage rate (APR) or deny you a loan - even if you pay off your credit card balance every month and have never exceeded your limit. About 14% of Americans use at least 50% of their available credit, according to Experian's 2007 national score index study. But, experts recommend keeping your debt-to-limit ratio under 30%, or even under 10% if possible. That means if your limit is $5,000, then you should aim to charge less than $500 a month. The lower your debt-to-limit ratio, the better your credit score will be. And to that end, there are two basic ways to improve your debt utilization: raise your credit limit or lower your debt. Your credit card limit is listed on your monthly bill, but it can change from one billing cycle to the next. 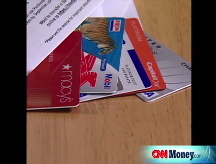 That's because credit card issuers can raise or lower your limit as they see fit. But even though credit card issuers generally dictate what your limit is, consumers do have a say. You can call and request that your limit be raised, as the more available credit you have, the better your debt-to-credit ratio will be. "If you have a good credit history your credit card issuer will up your limit, but if your history isn't great then they can say 'No,' which isn't necessarily a bad thing," according to Bill Hardekopf, CEO of LowCards.com. "Getting turned down for a higher credit limit may be a blessing in disguise," Hardekopf said. Chances are it's a signal that you should reduce your spending or pay down your credit card balances instead. When paying down debt, it's important to consider that your debt utilization is calculated per card and cumulatively. That means that leaving one card nearly maxed out will negate all the hard work you've done paying down the balances on other cards. And a higher limit isn't always better. "If you are a spender and the temptation is there to spend more than what you can really afford, [then a higher credit card limit] can send you into the debt spiral," Hardekopf said. It's also possible that potential lenders will view a sky-high credit limit as potential debt, which can count against you if you are trying to get a mortgage or a car loan. Ultimately, "it boils down to how you handle debt. If you handle debt responsibly, then go for a higher limit," said Greg McBride, senior financial analyst at Bankrate.com. But, consider whether "that higher credit limit is going to represent temptation to run up additional debt." Ideally, you want to illustrate that you can keep your spending under control, and that means "your focus should be on paying down debt, not racking up more," McBride said. Signing up for new cards to boost your total available credit and make your debt utilization appear lower can work against you, experts say. In fact, opening new accounts can even lower your credit score. "Recent credit inquiries constitute 10% of your score," McBride said. And each new inquiry means potential points subtracted from your total. Additionally, closing unused cards is also a bad idea. "When you close an account the amount of 'overall' available credit decreases, which could cause an increase in your [debt] utilization and inadvertently lower your score," said Deanna Templeton, director of consumer education for Credit.com. Templeton also recommends using old credit cards periodically, just to prevent your issuer from closing them because of inactivity. "Every so often charge something small like gas or dinner, and then pay it off when you get the bill," she said.